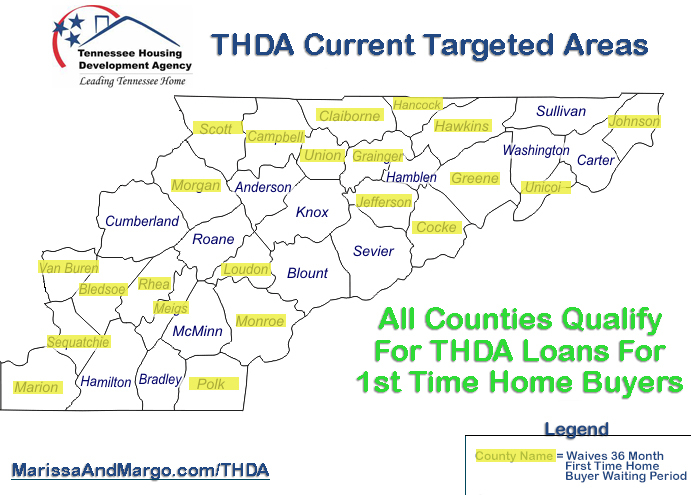 March 1, 2017 THDA begins $15,000 in down payment assistance in 30 counties! Down Payment Assistance in the amount of $15,000 is available in 52 Zip Codes across 30 counties in Tennessee!! The $15,000 is a forgivable 2nd mortgage with 0% interest rate and no monthly payments! If you sell, move out, or refinance in 10 years you owe absolutely nothing back! Beginning year 6 the loan amount due is reduced by 20% per year, so in year 8 of your mortgage you would only owe $6,000. This program is incredible and it is paired with the already awesome Great Choice mortgage loan. We love the people at THDA and can’t wait to help you get into a home. Looking to buy in these zip codes? Get $15,000 to help with your down payment with 0% interest and it forgives after 10 years! Have you ever heard of THDA? This incredible organization is responsible for helping the citizens of Tennessee become home owners, either for the first time or after not owning your primary residence within the last 36 months. Certain counties in Tennessee WILL WAIVE the 36 month exemption! So even if you own your own home now and are wanting to move, you could qualify for a THDA Mortgage with down payment assistance, that’s 100% Financing! Conventional Loans typically require a 20% down payment, so if you wanted to buy a $200,000 home then be prepared to write a check for $40,000. No problem, right? That’s where THDA becomes valuable in Making Homes Come True. Loudon County, Scott County, Campbell County, Claiborne County, Hancock County, Hawkins County, Johnson County, Union County, Grainger County, Green County, Unicoi County, Morgan County, Jefferson County, Cocke County, Van Burren County, Bledsoe County, Rhea County , Meigs County, Monroe County, Sequatchie County, Marion County, and Polk County. So what if I want to buy a home in Knox County, Anderson County, Sevier County, Blount County, or any other county in Tennessee? If the county is NOT on the “Current Targeted Areas” list that waives the 36 month requirement you can STILL use THDA with down payment assistance. The requirement that you have to meet is that you can not, in the last 36 months, owned your primary residence. An example: you owned a home five years ago, but have not owned your primary residence in the last three years, you are still considered a First Time Home Buyer and are eligible for THDA! The other way you can qualify for a THDA loan within the 36 month window is through the Veteran Exemption. Veterans, defined in 38 U.S.C. Section 101, and their spouses and have not previously used this THDA benefit. If you clicked that link then you saw it was a 14 page, double rowed PDF in small print with a whole bunch of confusing language. THDA gives this short summary. Generally [this] includes anyone who (a) who has served in the military and has been released under conditions other than dishonorable or (b) who has re-enlisted, but could have been discharged or released under conditions other than dishonorable. As a general rule of thumb, most requirements are very similar to the FHA program. THDA offers additional state money on top of the federal program to cover up to 4% of the down payment and closing costs, which FHA loans require. Contact Us or give us a call at 865-936-9100. No cost or obligation, we would be thrilled to talk to you about the benefits this program offer.